Home > ADRL > AlAnabi Racing > Drag > DragRace > News > NHRA > ProMod > Qatar Drag > Qatar Racing Club > Mike Castellana strikes in Qatar! Mike Castellana strikes in Qatar! 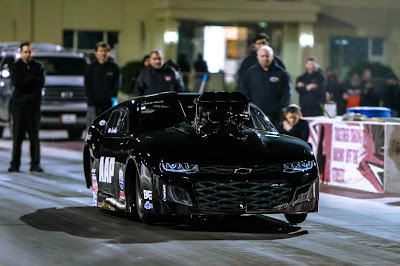 Mike Castellana with a win in Qatar at the Arabian Drag Racing Competition last weekend after Mike Janis got a red light at the tree to keep him off a third winning streak in the ongoing championship in Doha.Mike Castellana was driving his NHRA Legal Pro Mod 2017 Camaro ZL 1 tuned by Frank Manzo. With Frank Manzo tuning this thing and Mike and Cassey working on it,I mean they give me an awesome race car to race and its up to my job to do the rest and we all as a team we came out to win this round - Mike Castellana at the Winners Circle in Qatar! Mike Janis Superchargers with a first back-to-back Pro Mod win in over 20years! 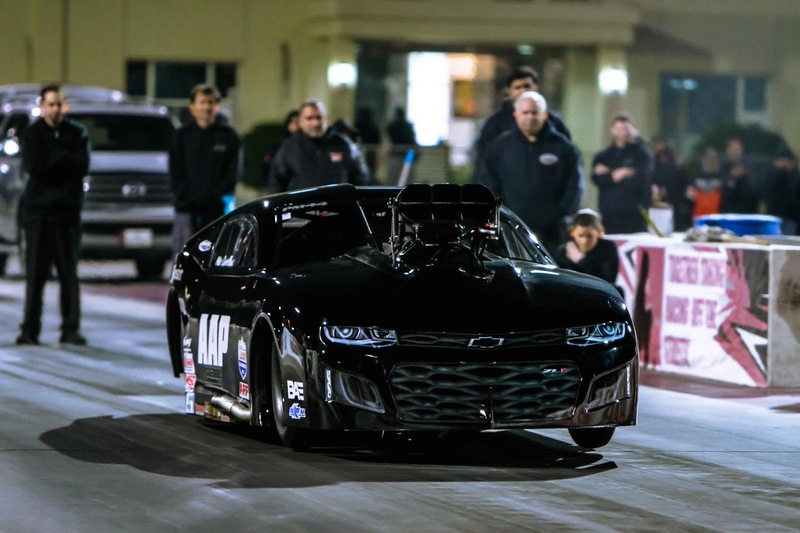 The Al Anabi team will be unleashing a possible five cars (not confirmed report) to the NHRA Pro Mod 2018 season and the team has been camping in Qatar and using the opportunity to test the cars for the NHRA kick off. Richie Stevens Jr was in the Speedtech '69 Camaro shortly before his '16 Camaro arrived in Qatar giving way to Todd Tutterow to steer the Speedtech '69 Camaro. Mike Janis was round's favorite to win the championship for the third time after registering a personal best ET 3.74@200 at the eliminations round against Kuwait's Bader Khorsheed before Castellana stirred things up. The car was tuned by H.E Sheikh Khalid Bin Hamad. Spotted in Qatar too was Shanon Jenkins though his Mustang was not in play but we would be keen on following what he is up to with the Qatar's team at the NHRA season. Mike Castellana outran Todd Tutterow to meet Janis at the finals and proceeded with his consistency to win the Round 3. Frank Manzo tuning,Mike and Cassey too onboard the first NHRA Pro Mod car into the 5.6s trim. The Arabian Drag Racing League heads to its Round 4 on 15th and 16th Feb at the magnificent facility at Qatar Racing Club. The championship sponsored by the godfather of drag racing in Middle East H.E Sheikh Khalid Bin Hamad and Castellana was quick to give his appreciatoon to the man behind it all. What KH has done over the years giving as opportunity to race like this, not just the dedication from his part, we keep looking forward to going at it - Mike Castellana at the winners circle of ADRC R3. Speaking to our team in Qatar days before the race,Mike Castellana refuted any possibilities of ever moving to drive a top fuel. I don't think so.I enjoy doing this. And this where i am gonna let my limit be - Mike Castellana Speaking to our team in Qatar.